What Causes The 25002 Error? The causes of this problem are basically going to be down to the way in which your PC will not be able to read the files or settings required for the installation to commence. The problems include the likes of your user account not having the correct permissions to run the file, as well as having a series of different issues with the “registry” of your system, etc. 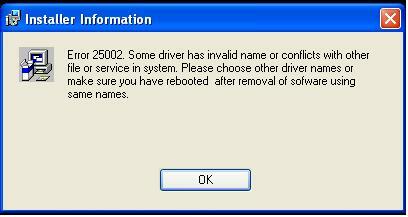 The first step to resolve the 25002 error is to make sure that you have the correct permissions on your system. Many people use a series of different user profiles on their PC, and it’s often the case that your system will not have the correct permissions required to install the software on your PC. The bottom line is that if you aren’t logged on as an administrative user, log out and then log in again with a user account that has the required rights. Double-click NtfsDisable8Dot3NameCreation in the right-pane. Next, change the data in the Value data field from 1 to 0. Exit RegEdit and then restart your PC. Install Symantec AntiVirus Corporate Edition client on your computer. After the installation is complete, change the value ofNtfsDisable8Dot3NameCreation back to 1.